The spring season is beginning to wind down, and the summer crops are growing well and will be ready to harvest in just a few more weeks. Until then, our spring crops are on their way out and so there is less that the garden has to offer in this in-between time. This week is a little smaller of a share, but we are saving some great crops to harvest for you next week, which will likely be your final week of the CSA. Speaking of summer crops- have you signed up for the summer season yet? We still have room for you! We also have a few new locations that we are excited to tell you about: For the metroplex, we will begin this summer delivering to North Arlington and to North Dallas, we’re back in Trophy Club, and Rockwall, too! In the East Texas area, our new spots in Lindale and the Azalea district are going splendidly. Will you pass our name along to someone who lives in these great areas? Lettuce—Each share received several petite heads of our wonderful late-season lettuce varieties. They stay small, but they are heat hearty (most lettuces can’t handle growing in our Texas spring heat), and they are super delicious. Kale—Large shares received curly kale- crisp and hearty for soups, kale chips, or sauteeing. Small shares received Lacinato kale, often called Dinosaur kale. It’s prized by chefs, and is a bit more tender than the curly kale. Try one of our many kale recipes in the kitchen blog. Onions—Each share received a few of our sweet yellow onions. These have now had enough time to cure that you can store them for a while if needed, or eat them up soon. Collard Greens—A classic, southern staple, collard greens are super good. Sauteed with a little bacon or a ham bone, onion, and garlic. I like to slice them into super thin strips, like maybe a 1/4 inch at most. Here’s how I do this quickly and easily: remove the stems with a sharp knife, stack up all the leaves, roll them into a tight roll, and then slice the roll into super thin ribbons. sliced this way, they also make a good base for a salad or slaw. Cabbage—Small shares received one small purple cabbage, or two petite purple cabbages. I love the beautiful silver color on these leaves. Large shares received my favorite variety: cone shaped cabbage! It’s a normal green cabbage, but the variety has been selected and cross-bred over time to grow conical rather than spherical. This used to be a very popular cabbage shape in the early 1900s that kinda of went out of style (did you know that crops come in and out of style?) and they’ve been revived through modern heritage and heirloom seed interests. These cabbages have not enjoyed our super wet spring, and did not get very big, but we have a few more varieties growing well that will be ready in the early summer shares. The many leafy greens will all last longest stored in the refrigerator, sealed up in a bag or container to retain their moisture. The onions can be kept in a dark cool place. As a general rule, wait to wash any veggies until you’re ready to use them to help retain nutrients and prevent spoilage from excess moisture. We’d love to hear stories and recipes of your culinary adventures this week. Send us a note or post a comment of how you’ve used your CSA share! 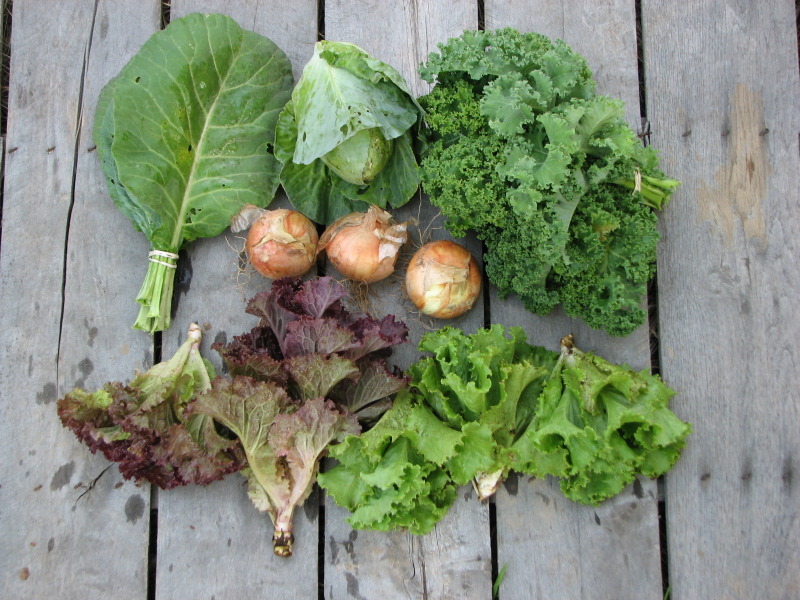 Large Share: Collard green, cabbage, sweet yellow onion, curly kale, and mixed lettuce across the bottom. 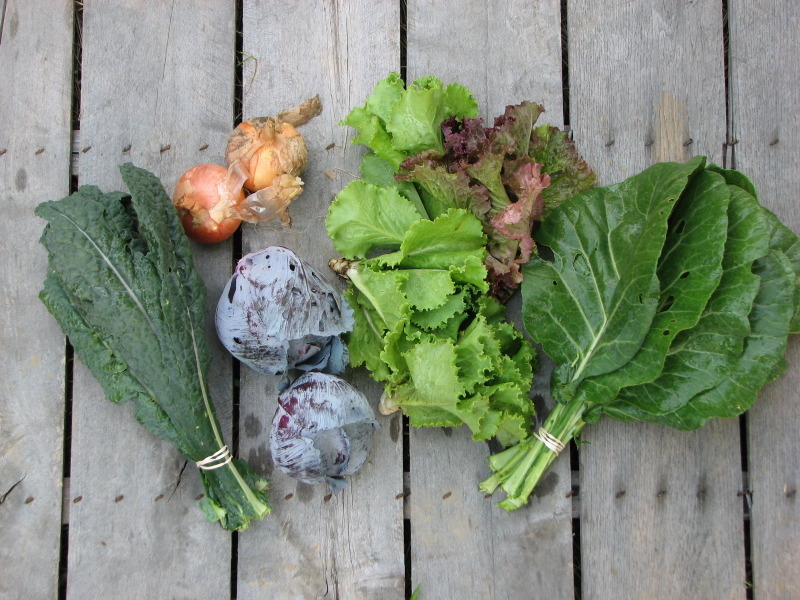 Small share: lacinato kale, sweet yellow onions, mixed lettuce and collard greens. So, next week (week eight) is the end of the spring share? I thought we signed-up for a ten week commitment, no? Maybe my mistake. Some seasons last a full 10 weeks if the garden is still supplying enough for everyone, but it doesn’t always end up that way. You can see the details of season length and your commitment in our Farmer Member Agreement page!